eFFiciency research has already been involved in the development of several products that have successfully been marketed. The following items give a summary of the sphere of knowledge encountered in the development of these products. High Efficiency Power Supplies: innovative topologies have been developed to reach conversion efficiency in the range of 96 to 98 % depending on the application and cost optimization. Fast algorithms running on digital signal processors have been implemented to accurately control these converters. Long Range Radio Frequency Communication: efficient antennas, power amplifiers, low noise amplifiers, innovative modulation / demodulation schemes have been put in operation to develop low bit rate hand-held communication devices that inter-operate over ranges of several hundred meters to hundred of kilometres. Signal Integrity: signal integrity problems in the 100 to 1000 MHz range have been resolved . Advices to avoid such problems have also been provided. 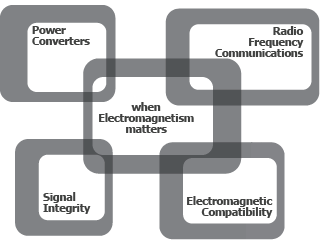 Electromagnetic Compatibility: in the electromagnetic compatibility area, one always has to stay cautious. However, with more than 15 years of experience in the electromagnetic compatibility, eFFiciency research has already covered several aspects of electromagnetic compatibility in the board, device and system level.